The proof is in the pudding, or so they say. But what does that actually mean? And what purpose does it serve to open a marketing article like this, besides of course making my readers ravenous for delicious sweet treats. Give in to the pudding. Well, you might be surprised to learn that the actual saying is, “The proof of the pudding is in the eating.” What that means is that something has to be experienced in order to prove how good it is. But the problem is that most people aren’t willing to invest time or money into something on the off chance that it might be good. So as a marketer, how do you get someone to purchase a pudding without having them try it first? The simplest way, and one of the most effective, is to provide social proof. Here’s the thing about your brand: most people don’t trust it. Now don’t get upset at me for saying so. It’s a bit of an inconvenient truth, but it’s true all the same. Don’t feel too bad about it, public trust in all businesses and brands are now at an all-time low. A survey by Lab42 found that only 3% out of 500 people believed that claims made by ads were “very accurate.” The vast majority of respondents believed all advertisements were exaggerated in one way or another. Social proof overcomes this distrust by taking the claims out of the mouth of the advertiser and handing them over to ordinary or not-so-ordinary people. In order to understand how that works, you must first understand a couple of quirks about the human brain. You see we humans, at our very core, are pretty cynical creatures. We don’t give out our trust freely—it must be earned. But it can be hard for any brand to earn that trust if the potential customer isn’t even interested in seeing what you have to offer in the first place. All social proof is doing is helping you establish that trust with your customer before they purchase by leveraging another quirk of the human brain: our need for advice and confirmation from others before we make a decision. Especially if we’re uncertain about the outcome. You don’t have to go very far to see social proof in action. Just think about those parachute pants, skinny jeans, and trucker hats stowed away in your closet, never to see the light of day again. Or that time you went to watch Suicide Squad because your friend said that they really enjoyed it. And thus I learned a valuable lesson of checking reviews before watching a film. You could cast it in a cynical light and call it peer pressure or herd mentality. But in actuality, social proof is a highly influential factor in our decision-making processes, and a valuable one, that relies on our social nature to boost our judgment. If we can see that other people have been through a similar situation and have had positive experiences, then we’re far more likely to take action. Here are the five types of social proof out there that you can easily incorporate into your own marketing strategy. If you know even a little bit about influencer marketing, you’ve seen social proof in action. One of the easiest ways to establish trust through social proof is to get a stamp of approval from an influencer. Basically, an influencer is someone who holds a high degree of trust or credibility with your target audience. This can be anyone from a high-profile fashion blogger to a more widely known celebrity. Here’s a nifty infographic by the folks at Traackr on the different types of influencers. But don’t get caught in the trap of thinking that just because someone’s famous they’re automatically an influencer. An influencer isn’t someone who just happens to have a large audience, as they must also have the ability to persuade and convince that audience. The beautiful thing about using influencers as part of your marketing strategy is that it’s extremely powerful when done right. One of the easiest ways to incorporate social proof from an influencer into your marketing strategy is to feature their testimonials on your landing page. Testimonials from an influencer, especially an authoritative influencer, are a great way to immediately establish trust with your audience. They have an air of objectivity because the person giving the testimonial is someone outside of the brand. The influencers aren’t just well-known, but they’re also the type of influencer that your audience would listen to and aspire to be. For his Kickstarter project The Freedom Journal, John Lee Dumas used this form of social proof expertly. Not only are there testimonials from authoritative influencers like Chris Brogan and Andrew Warner, they also represent the exact type of person he knows his audience will respond to the most. But they also give great testimonials that directly address the problem his product is trying to solve. In the end, Dumas was able to raise more than $453,000 for his project, making it the sixth-most-funded publishing campaign of all time. Another way to use this type of social proof is to have an influencer directly recommend your brand to their audience. It can be something as simple as having them give you a shoutout on social media, to them directly promoting your product over their email list for you. To see how powerful this strategy is in action, all you need to do is take a look at Lord & Taylor’s masterful campaign that relied upon 50 carefully chosen Instagram influencers to promote their Design Lab collection. Employing a thunderclap strategy, Lord & Taylor had 50 well-known fashion Instagrammers post pictures of themselves wearing the exact same dress, on the exact same day. In one day, followers of the Instagram fashion world had their feeds flooded with multiple influential trendsetters and tastemakers wearing the exact same dress. No matter how hard teenagers around the world may protest against such a concept, at the end of the day, we humans are social creatures that instinctively like to go with the crowd. This is a holdover from our prehistoric days when traveling in packs determined whether or not you’d end up as dinner for some apex predator. Thankfully, our chances of survival are no longer determined by our willingness to follow the group. However, that primal urge to be a part of the pack still resides in each and every one of us. Unlike using influencers, where you’re aiming to build trust through the credibility of a single individual, the “wisdom of the crowd” approach is designed to influence your audience through sheer numbers. What you’re effectively doing is leveraging that inherent understanding that there’s safety in numbers. It’s that idea that if there are a huge number of people doing something, then it has to be good. Just take a look at the street corner experiment, in which three social psychologists tested how susceptible people were to this effect. They placed a single person on a street corner and had them look into the sky for 60 seconds, and only a few people bothered to stop to see what the person was looking at. The next day they had five people staring at the sky, and this time around, four times as many people stopped to look at the sky too. On the third day, the researchers put 15 people on the same street corner staring up at the sky and 80% of all pedestrians found themselves looking up at the sky. So how can you incorporate this type of social proof into your marketing message? The most straightforward way to do this is to simply start drawing attention to your numbers. Everything from social media mentions to the number of customers served, if you’re pulling in decent numbers anywhere, you need to start letting people know. Popular email marketing tool Mailchimp immediately lets anyone visiting their homepage know of their 12 million users. Not only is it an impressive number, but you also instinctively feel safer knowing that so many others are using this service. After all, they can’t all be wrong can they? However, just drawing attention to the sheer numbers you’re generating, impressive as it may be, isn’t the most effective way to use this kind of social proof. The key, it turns out, doesn’t lie in the numbers alone, but how you present that data. Think of it this way. If you walked past a busy restaurant, you might be inclined to check it out one day. However, how much more likely are you to try the food at the restaurant if everyone you know is talking about how much they want to try it too? A recent study has found that we’re not so much influenced by what everyone else is doing, as much as we are by what everyone else wants. To see how powerful this is, all you need to do is take a look at every iPhone marketing campaign ever. Something that Apple does brilliantly with the wisdom of the crowd approach is show off how many people want the iPhone. In 2012, just one hour after the iPhone 5 went on sale, Apple released a statement claiming that they had sold out due to heavy demand and that delivery would be delayed. Whether real or not, Apple managed to successfully create a sense of scarcity and exclusivity around the iPhone, hyping it up even more. In one fell swoop, Apple was able to subtly tell everyone that millions of people around the world desired their product. Much like influencer endorsements, this type of social proof relies heavily on the quality of the individual’s authority. However, there is a lot more flexibility in how you can use this form of social proof. Nowhere else will you see this more clearly than in the glitzy world of Hollywood. Take a look at any movie poster. You’ll often find it emblazoned with stars or the logos of film festivals it’s been featured in, snippets of reviews it’s received, with the actors’ names featuring prominently. What all of these elements are aiming to do is act as badges of proof, or trust seals that what you’re about to watch is indeed a good film. All in one glance. Just like with influencer endorsements, what’s happening is that you’re leveraging the trust and authority that each of these elements carries in order to deliver social proof. Let’s take a look at the Academy Awards. Despite the multiple allegations of corruption, bribery, and even ties with the Illuminati, the Academy Awards is one of the oldest entertainment awards ceremonies in the US and is still considered one of the gold standards in the film industry. To even be nominated in the “Best Actor in Leading Role” category is considered a huge achievement for any actor, a testament to their brilliance. Already this is a form of social proof. The words “Academy Award nominated/winner” act as a trust seal to audiences everywhere that not only are they in for a good performance, but potentially a great movie. In a more common marketing strategy, you’ll often find websites displaying the logos of the media outlets that they’ve been featured in. This is an excellent form of social proof because publishers, especially established news outlets, generally carry a sense of objective authority. Most news outlets will only report on something that’s worth talking about in the first place, and typically don’t owe any allegiance to the subject of their coverage. By associating yourself with these media outlets, you’re telling the world that your brand is newsworthy and that people should be paying attention to you. But you don’t have to use this type of social proof solely for potential customers. At Foundr, we often use this type of social proof whenever we find ourselves needing to pitch, or get in contact, with high-profile influencers. Notice how we make sure to mention other notable entrepreneurs that we’ve featured in the past as part of our pitch. Essentially what we’re doing is borrowing their influence as a way to showcase our own level of authority and credibility. You can also check out more of our email templates right here. A large part of why social proof works so well is because, when confronted with an unfamiliar situation, we look to others who have gone through similar scenarios to see how they handled it. We inherently understand that there is risk in the unknown, which is why we instinctively wait for someone else to test the waters for us. This is why we all loved to play the, “no, you go first” game when we were kids. Here’s another inconvenient truth for you. There is almost nothing you can say to your customer to help allay their fears outside of trying to convince them that the rewards outweigh the risk. No matter how good your sales copy may be, it doesn’t stop the fact that customers trust product reviews 12 times more than product descriptions. That means when customers are looking to make decisions, they’re not looking at you to help them through it. Nope, instead they’re looking at your other users and customers to see what they think. They went first. At the end of the day, no matter how much we may respect the authority of an influencer, we want to hear it from someone just like us. The reason user-generated social proof is so powerful is because we know that the opinion we’re seeing is unbiased and, most importantly, genuine. The most common way you’ll see user-generated social proof put to use is through customer reviews or testimonials. You can see how we use this type of social proof on our sales page. Notice how we use a mix of testimonials from high-profile influencers like Neil Patel and Daniel DiPiazza, along with actual members of our community. It’s absolutely vital that you have this type of social proof at your disposal, with 70% of Americans saying that they look at product reviews before making a purchase, and 63% reporting that they’re more likely to purchase from a site that contains product reviews and ratings. Delivery food service Menulog does a great job of subtly incorporating user generated social proof into their site. Anytime you visit a restaurant that you want to order from, you’ll see a popup that will tell you the last time someone ordered from the same place. While not as in-depth as a user testimonial or review this is still a brilliant piece of social proof, because it immediately reassures the customer that they’re not the only one. You can immediately be assured, in real time no less, that there are users other than yourself ordering from the same place. Someone went first. When it comes to providing user-generated social proof though, nothing works better than content from the user themselves. If there is a way for you to incorporate user-generated content into your marketing strategy, you should do it. Immediately. In my opinion, no one does this better than Frank Body. Frank Body is a skincare brand whose marketing strategy relies heavily upon showcasing user-generated content. As you can see from their Instagram page, a large portion of the content is pictures of their customers actually using their products. Potential customers visiting their page are immediately flooded with images of happy customers using Frank Body’s coffee scrub. User-generated content is such a fantastic form of social proof because it strongly implies a high level of trust and satisfaction of the product itself. While a review or a testimonial is all well and good, being able to actually see a happy customer is an entirely different experience. When we last spoke with Frank Body, they were on track to make $20 million in revenue from their Instagram marketing strategy alone. When it comes to having positive social proof, nothing is more powerful than having a friend recommend it to you. According to the Nielsen Global Trust in Advertising survey, recommendations from friends and family is by far the most trusted and powerful form of advertising out there. A six-month survey by Oglivy, Google and TNS found that word-of-mouth as the most powerful factor when it came to a person’s awareness and relationship with a brand. Just like with using influencers as social proof what you’re relying up on is something called the halo effect. The psychological phenomenon where our opinion of something is heavily influenced by our impression of the person themselves. Meaning that, especially when it comes to decision-making, the message isn’t actually as important as the messenger. An endorsement from a friend or a family member carries extra weight because, no matter how much authority an influencer has, you know you can actually trust a friend. Unless of course you’re Michael Corleone then maybe it’s a good idea not to trust anyone too much. While extremely powerful, it’s inherently difficult for marketers to utilise this type of social proof. It’s tricky because the process of turning an existing customer into a brand advocate is often a long and tricky journey that’s more about good customer service than it is about good marketing. However that doesn’t mean that it’s impossible. The best way to incorporate this type of social proof into your marketing strategy is to create a viral loop of some sort. A viral loop is a tactic where you create a loop that encouragers your pre-existing customers to talk about your product to other people, and therefore bring in new customers or users. The idea is that by building a viral loop into your product you create an evergreen method of customer acquisition. The most straightforward way to do achieve this is by building a referral program, where you incentivise your customers in some way to recommend your product to someone else. You’re probably already familiar with this tactic, seeing it everywhere from gyms to fashion sites. They all follow the same basic structure where the user is given some sort of discount or upgrade if they manage to get another friend to sign up with them. For Dropbox, a large reason why they’re the go-to platform for cloud storage is because of their incredibly successful referral program they used. In the early days 60% of Dropbox’s signups could be attributed to their referral program. 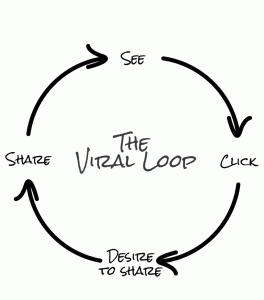 The viral loop Dropbox created was simple. Once new users were signed up they would see a pop-up which offered them the chance to refer a friend. The key to creating a viral loop is to make the referral process as easy as possible. The incentive was that one the other person signed up, then both users would immediately receive an extra 500mb of storage. Dropbox not only made sharing and raising awareness of their product as easy as possible, but they also rewarded their users for doing so. There’s one more great thing about using social proof in your marketing that I want to close with. Sure it’s powerful, and it can be easier and more cost-effective than traditional advertising. But a big reason so many startups love demonstrating social proof is that it’s a more genuine way to market what you’re offering. While advertising and product descriptions must convince people of the value of your product or service, social proof shows them. True, it’s not always pure altruism driving it. But if you’re doing it right, and your company is doing great work, there’s no better feeling than having gained the appreciation of other people, and holding that up as proof. How do you use social proof in your business? Have you seen any brands crushing it with social proof? Let us know in the comments! Totally a viable option, social proof is just one tactic in the marketer’s toolbox after all. Personally though I do believe that social proof is ultimately a much more powerful force of persuasion. Great article! I agree with what you said about social proof as a way to establish credibility. Thanks for the tips on how to build customer loyalty! I kinda agree – Social Proof is a powerful force based on a strong feature of human nature. On the other hand, I think emerging brands and small businesses might benefit from another approach – i.e. leveraging people’s desire to feel special. What’s your view, could it be a viable option as well?